More and more silicone cooking utensils and bakeware are on the market. Home (and professional) chefs have the benefits on lock: silicone whisks and tongs don’t mark delicate nonstick pans, silicone baking mats are non-stick and heat-resistant, and silicone by its very nature discourages the growth of microbes (hello, cleaner kitchen!). If you’ve been cooking with silicone for a while, you may be aware that the natural state of silicone is a bit gummy, and that’s normal. We absolutely love our silicone baking mats but cleaning them has been a bit of a challenge. They seem to pick up a bit of “goo” after some usage. The most frustrating part of using these silicone mats is how they seemed to always feel “weird”—oily or grimey. It turns out that you can easily fix this problem and have a clean baking mat quite easily. How to clean silicone baking mats. If your mat is super greasy (what’s shakin’, bacon) or has cooked-on particles stuck to it, soak it first. Fill your sink with super hot water (don’t burn yourself) and grease-cutting dish detergent. Let the baking mat soak dirty-side down in the water for 10 minutes, then put on some thick dishwashing gloves and scrub the silicone mat with a sponge. This process should remove grease and debris. We got a great tip on cleaning baking mats here using all- natural products. Your kitchen counter might work best for easy clean-up, in the empty sink itself, or lay out kitchen towels on your table to catch residue. Lay your mat out flat, “dirty” side up on the countertop, inside the sink, or on towels. 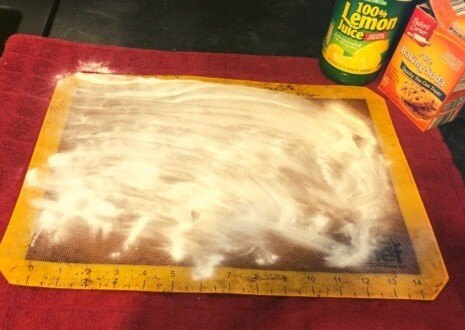 Sprinkle a light dusting of baking soda onto your mat. Cut a lemon in half. Rub one half all over the mat and scrub gently. This will create a paste. Note: If you don't have a lemon, feel free to use lemon juice and a dishrag. Let the paste sit for 10 minutes. Run mat under warm water until baking soda paste has been rinsed away completely. Don't be shy about putting your silicone baking mat in the dishwasher top rack and run it with your other dishes. This is my favorite method because I feel like it removes that oily residue the best. The key here is to put the mat on the top rack. If you still feel a bit of oil on the mat, just run it through one more time. Keep in mind that your silicone baking mat will likely always feel a bit tacky and that is normal for a baking mat. You want the baking mat to be free of baked-on debris and coated grease but you still want your food to slide right off. Making sure your new mat gets cleaned thoroughly from the get-go means it will retain its nonstick properties for a long time. Are silicone baking mats safe to use? Yes, these baking mats are considered safe for use with food by the FDA. As long as you make sure that your silicone baking mat is marked as food safe, you are free to bake with it. Always note the max temperature that your mat can be heated too. In general, the max heat is 400 to 450 degrees F. Read the care instructions that come with your mat. My baking mats are stinky when they get hot. What do I do? Some users note that their silicone baking mats smell or smoke when used at high temperatures. When new, some mats also “off-gas” but the stink eventually dissipates, and shouldn’t affect the taste of the food. Be sure to read the instructions that come with the brand of mat you have. If smoke is coming from your oven, use a hot pad/heat-resistant glove to remove the pan with mat and place in the sink to cool. Make sure this is a heat-resistant silicone baking mat and NOT a thin plastic cutting board (these can get hot or melt). Sometimes these are easily confused. Maybe your oven setting is too high for your brand of mat — try turning the heat down. If all else fails you may need to replace this mat. How to use silicone baking mats? Home and professional bakers alike use silicone baking mats on a cookie sheet, roasting pan, jelly roll pan, casserole dish, almost any type of pan you’d normally put in the oven. Usually, these mats protect the food from sticking, but also keep you from having to scrub the pan when you’re done. Slip your mat under foods that would typically stick to your pan, such as cookies, biscuits, bacon, chicken, delicate foods like salmon (you know how the fish skin can stick to the pan? ), puff pastry, macarons, and lots more. Parchment paper works the same way, but silicone baking mats are reusable, and parchment paper (we love the unbleached, pre-cut sheets kind) is disposable. There are mats marked with measurements to help you as you roll out dough. Some come in sets of three sizes for different pans. Don’t lay your mat directly on the oven rack. Don’t grease your silicone baking mat. They are made to be non-stick. Do lay your silicone mat on a baking sheet prior to placing your food on the mat and then in the oven. Don’t use your silicone baking mat like a cutting board. 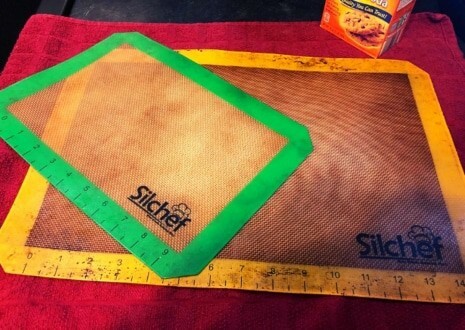 Don’t use your silicone baking mat if it’s been cut or torn, or has cracks or creases. Don’t stack heavy objects on your silicone baking mat, especially when it’s rolled up, since this can cause damage to the filaments inside. If the mat has a fiberglass core, these filaments can be ingested, which could be bad for your health. Don’t use an oven temp above 500 F for most mats. If you don’t have the original usage information, it may be safest to keep the temp at 400 or less or the mat can smoke and stink. Do store your mat flat, if possible. Do wash your baking mat right away after baking. Do use a baking mat in your toaster oven to help with clean-up. Can silicone baking mats go in the dishwasher? Yes, you can put a silicone baking mat in the dishwasher. That is actually one of the easiest ways to clean a baking mat. They are heat-resistant, and make it through an indefinite number of washings. How to store silicone baking mats? ​It is recommended that you lay your baking mats flat, which is how we store ours. Another option is to roll your baking mat up and push them inside of a cardboard tube such as used paper towel tube. Be sure not to lay heavy pots and pans on your rolled or folded mat or it can cause damage to the mat. Silicone baking mats can be quite handy in any kitchen but they can also be a bit challenging to clean. Hopefully, these cleaning options help you decide if a silicone baking mat is a good option for you.